In 1942, the federal government selected Oak Ridge, Tennessee, as a development site for the Manhattan Project, a government operation charged with designing the first nuclear weapon during World War II. Prior to 1942, Oak Ridge was merely a loose collection of small farming communities located approximately 25 miles outside the larger city of Knoxville. Its relative isolation and cheap land made Oak Ridge stand out to General Leslie Groves, the military head of the Manhattan Project, who bought out the farmers for $50 per acre. The town was designated a secret, not located on any map, and fenced in by guarded gates. The original projected population was 13,000 people, mainly scientists, engineers and army personnel who relocated with their families from across the country. Within a year the population swelled to 42,000 and by 1944 the town was home to 60,000 inhabitants. The population rise was rapid but brief; by 1945 the population reached its peak at 75,000 members. For all its rapid increase, the town remained anonymous. When the Oak Ridge Gazette published its first issue on September 4, 1943, no names were printed and the editors printed reminders that the townspeople should remain behind the gates. Oak Ridge remained classified information until two years after Word War II ended, when the U.S. Atomic Energy Commission transferred control of the facility to civilian leadership. Many of the town’s new inhabitants were Jews who moved for their work. Abraham Leavitt was reported to be the first Jewish resident of Oak Ridge when he moved from Atlanta to work as a telephone communications specialist for the Manhattan Project. He joined several young Jewish families who had relocated to the secret installation. In its infancy Oak Ridge had one non-denominational prayer space, Chapel-on-the-Hill, which was used by community members of all faiths. The first official Jewish service performed at the chapel occurred October 15, 1943, and was attended by 20 people. Joseph Jaffe and Captain William Berstein, both lay members, led a Reform service using prayer books loaned by Temple Beth-El in Knoxville, the closest formal congregation to Oak Ridge. Captain Bernstein, a medical doctor, played a major role in the early formation of an organized Jewish community. With no rabbi or formal congregation, Captain Bernstein organized services and acted as the public face of the congregation to the National Jewish Welfare Board. The Board gave the fledgling congregation $25 a month for support and sent Rabbi Elias Schwartz to the town for its first High Holidays season in September 1944. Since Oak Ridge remained a guarded military secret, Rabbi Schwartz could not report the number of people attending his service or other information about the town’s population. While a formal congregation did not yet exist, the Jews of Oak Ridge began to form companion organizations to enhance their religious and social lives. In 1944 the Ladies Auxiliary was established and soon began to publish a Jewish community newsletter. That same year, the first Sunday school class was held with six children enrolled. Other Jewish community groups soon followed, including a Hadassah chapter, organized in 1947, and a branch of the National Council of Jewish Women, founded in 1948. The community was coming together to create a religious and social home for a diverse group of Jews who had been displaced in Oak Ridge. In the 1950s, the fledgling Jewish community began to set down roots. Members constructed their first synagogue with their own hands, enabling them to conduct services independent of Chapel-on-the-Hill. In addition, they acquired their first Torah scroll and hired their first rabbi. The community raised $20,000 for their new home, the Beth El Center, which was completed and dedicated in 1952. Their Torah scroll was given to Oak Ridge in 1951 by the Orthodox Tifereth Israel Congregation of Brooklyn, New York, and was arranged by Herman Cember, a former member of the Brooklyn congregation who had moved to Oak Ridge. Tifereth Israel donated the Torah with specific conditions that it could be laid down only during religious services and would need to be housed in an Ark at all other times. Prior to the building’s dedication, the Torah was housed in a portable Ark carried to the Chapel-on-the-Hill for services and returned to a member’s home for the rest of the week. Although the congregation was composed of Orthodox, Reform, and Conservative members, they hired their first rabbi in 1954 from the Conservative movement. 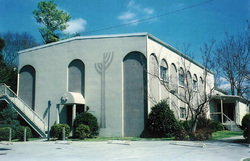 Rabbi Martin Kessler had also served a congregation in Asheville, North Carolina, before coming to Oak Ridge in search of a younger congregation. Rabbi Kessler officiated at the first Jewish wedding at the Beth El Center, the marriage of his daughter who came down from their home in New York to be married by her father in his new pulpit. The congregation remained unaffiliated until 1959 when it officially joined the Conservative movement. The discussion over affiliating with a national movement had begun years earlier, but no action had been taken under Rabbi Kessler. He resigned in 1957 to move back North and the congregation hired Rabbi Kenneth Broomberg in 1958, who was a recent graduate of the Conservative Jewish Theological Seminary. The community continued with Conservative leadership until 1978 when the congregation hired Daniel Zucker, a graduate of the Reform Hebrew Union College. Rabbi Zucker was hired with special permission of the Conservative Rabbinical Assembly under the exception that the Jewish Theological Seminary had ordained only ten rabbis the previous year and therefore new job candidates were scare. The community maintained its Conservative-style practice during services and religious observances and maintained its affiliation with the movement. As the early Jewish population worked to organize itself religiously, they were also actively involved and committed to the larger Oak Ridge community. The B’nai B’rith lodge established an academic merit scholarship that was made available to any high school senior boy. Annual Jewish music festivals were established in 1956 as well as education programs teaching about major Jewish holidays organized by the Ladies Auxiliary. Perhaps the most popular cultural contribution to the community was the establishment of an annual play series at the Beth El Center by the Oak Ridge Playhouse. The plays were extremely well attended by both Jewish and non-Jewish audiences. The Jewish community became increasingly political in their involvement in Oak Ridge during the 1950s as civil rights came to the forefront of national dialogue. The community had been outspoken in favor of integration in the 1950s when the Atomic Energy Commission ordered the integration of Oak Ridge High School in 1955. The move was controversial and citizens organized the Community Relations Council to work on issues related to racial harmony in Oak Ridge. Several Jews were also involved with an effort to support equality in public services in 1959. Roberta Shor, a member of the Jewish Congregation, was actively involved in the Oak Ridge Federation for Equal Public Service when it was formally organized in 1960. She served on the steering committee and as co-chairperson in 1961. As the Jewish community focused its attentions outward, their own community started to outgrow their existing facilities. An addition of a social hall for the Beth El Center was funded and built. Several different rabbis served Oak Ridge in the 1960s and 1970s. The congregation continued its civic, social and cultural involvement in the wider community. While Oak Ridge Jews continued to be highly active, their numbers began to diminish. In 1968 there were 99 students enrolled in religious school; by 1976 there were 56, and by 1983 the number had shrunk to 33. In the early 1990s, there was a small resurgence in numbers of young children in the congregation. Today Oak Ridge maintains an active congregation with an involved membership. Many Oak Ridge Jews still work as scientists or engineers at the research sites maintained by the Department of Energy. From its secret beginnings to its concentration of scientists and engineers, Oak Ridge remains one of the most unique Jewish communities in the South.